The Eurasian country of Georgia in the Caucasus has the Lari as its national currency. The Lari, ISO currency code ‘GEL’, replaced the Kuponi in 1993. The Georgian Lari currency sign is ₾. The Lari’s subunit is the Tetri, with 100 tetri making up one lari. To convert your Georgian Laris to cash, select the type you want to exchange. 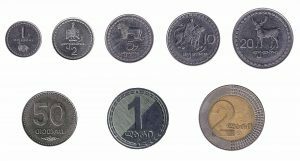 We exchange Georgian Lari banknotes, as well as Georgian coins.